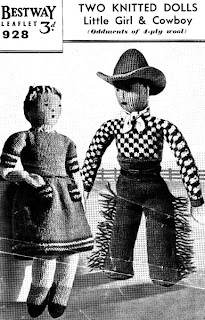 I found this wonderful site for vintage knitting patterns The toys are lovely but there are also great kids and adult clothes. You can buy the patterns online. What lead me here was the cowboy as I have a stool to upholster which has bow legs and looks like a cowboy! So I wanted to do a cowboy related image on the top, watch this space! oh goodness! those patterns are outrageous! thanks for the link.